Republicans have focused their advertising fire on Pelosi this year, and as a result, she and many Democratic candidates are hearing that question a lot. "You wake up each day thinking, what can I do to advance what I believe in, to make the future better. And then some reporter comes up and asks you: 'who are you going to vote for for leader?'" Pelosi said. "The most important thing is, what does this election mean for the American people?" Democrats want voters to focus on health care costs and access, jobs, and say a new Democratic majority will provide a check on President Trump's power. In order to amplify that message, Pelosi has spent the election cycle traveling the country and raising nearly $100 million for Democratic candidates. Last week she was in Laguna Beach and San Diego in her home state, fundraising and campaigning for Democrats Harley Rouda and Mike Levin. The two candidates are running for the types of seats that will likely decide control of the House: high-income, high-education districts that have historically been safe for Republicans, but have trended more blue in recent years. The idea that Democrats could win the Orange County and northern San Diego County districts would have been hard to comprehend when Pelosi was California's Democratic Party Chair in the 1980s. But on a Tuesday night, she was standing in the backyard of an oceanside mansion, pulling in $100,000 for the Rouda campaign. "Will it be a tsunami or will it be a wave?" she said, assessing Democrats' chances of winning back the House. "Either case it's tiny little drops of water, and all of them close races." Sitting in Levin's campaign headquarters the next day, Pelosi told NPR, "I have every confidence that we'll win. Not because I'm taking anything for granted, but because we're not yielding one grain of sand. This is urgent." The most immediate, high-profile — and perhaps with divided government — most consequential result of Democratic House control would be aggressive oversight of the White House and executive branch. Democrats would be able to set the committee schedule and issue subpoenas, and use that power to examine everything from President Trump's tax returns to former Environmental Protection Agency Administrator Scott Pruitt's countless ethical scandals. 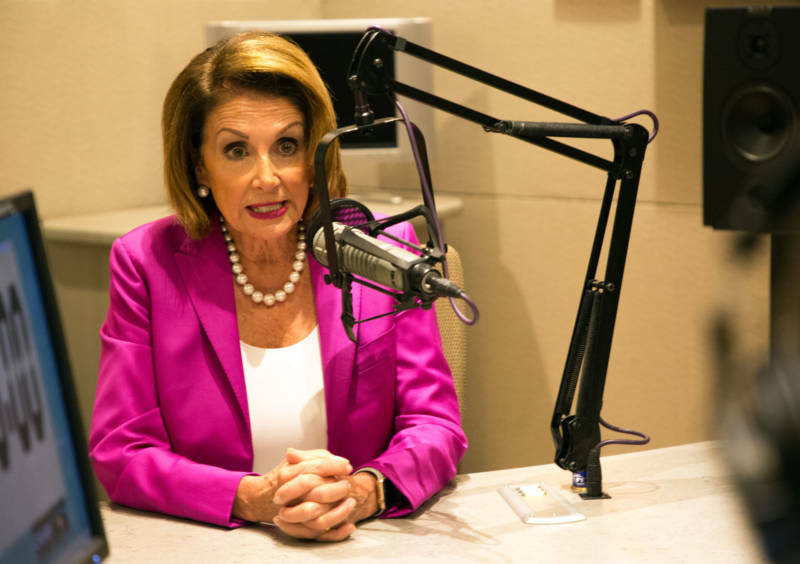 "You will see us use every arrow in our quiver to find the truth about what's happening in public policy, what they're doing to the environment," Pelosi stressed. "We see this as a culture of corruption, cronyism and incompetence." That focus on ethics is reminiscent of the last time Pelosi led her party to take control of the House in 2006 — a goal she's intent on repeating. The pace and scope of any Democratic-led probes – most significantly, whether or when to begin impeachment proceedings – would be one of countless strategic choices Pelosi or another Democratic leader would have to make. Every single one could pit members from the more center or right-leaning districts Democrats are trying to win against an increasingly energetic progressive movement within the national party. "That's, you know, creative tension, as we call it," Pelosi said afterwards about the two competing pressures. "There may be some differences in approach, but there's no difference in what our purpose is." On top of intra-caucus differences, the next Democratic speaker would also have to take into consideration a grassroots movement filling up with many political newcomers who flirt with or embrace socialism. These new members would likely be opposed to the types of compromises and deal-cutting Pelosi has built her career on. She doesn't quite see it that way. "You're just hanging out on the fringe," she said in a response to a question about growing "blow it up" sentiments in both parties' bases. "That's not really what we hear even in the most progressive districts. I represent San Francisco. Yes, people want us to use our leverage to have solutions come closer to their point of view. But people want us to get the job done." "I'm a liberal progressive from San Francisco," she said. "But if it is going to be sustainable, you have to find some common ground to do that." "I don't run into a lot of people who want to blow things up," Pelosi said. "If they do we can't accommodate them. You can have as big a tent as you want but people have to want to be in the tent." 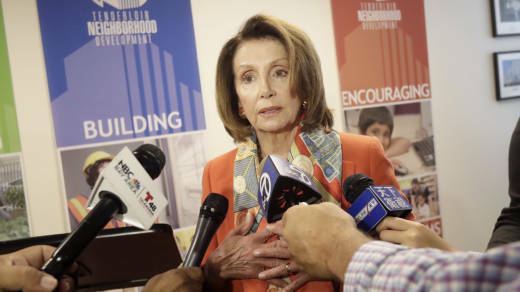 The best job security Pelosi may have is the fact that no other Democrat appears to be as well-versed as she is at navigating all those cross-currents. "Who's going to keep the caucus united? Who's going to govern? Who's going to be willing to travel the country relentlessly for candidates?" asked former New York Rep. Steve Israel, who once ran the Democratic Congressional Campaign Committee under Pelosi. "I don't know of anybody other than Nancy Pelosi who has been able to knit together the coalition necessary to reflect the fundamental values of Democrats and get things done." Israel dismissed the Pelosi-focused Republican attack ads as a "weak and ineffective strategy" in a campaign cycle dominated by questions about President Trump's popularity. But it's clear the pressure – and the constant media focus on whether Democrats will support her – have many candidates worried. Even as he held a fundraiser with Pelosi, Harley Rouda has not said publicly whether or not he'd vote for her as leader. And before the meet-and-greet with campaign volunteers, a Rouda staffer reminded the audience "not to post anything on social media" about the event. In addition to the Republican pressure, there's a vocal call for new leadership from several incumbent Democrats and first-time candidates. Still, Pelosi batted away questions about any sort of vulnerability. "We have 430 candidates. How many have you heard from?" she asked, when NPR posed the question. The latest count from NBC News stands at more than 50 Democrats saying they wouldn't support her. That doesn't appear to be enough to worry her — especially since it won't be clear until after Election Day which Democrats, and how many of them, will be voting for their next leader. There will be an internal vote using secret ballots for the top Democratic leadership spot in early December and then a public vote on the House floor in January. "I'm a numbers person when it comes to counting votes for legislation," she said. "Passing the Affordable Care Act, the Recovery Act, the list goes on — Wall Street reform and the rest. And I'm a numbers person when it comes to my own possibilities in Congress." So for the next two months, the most important number for Pelosi is 23. That's the net number of seats Democrats need to pick up to take back control of the House.